An indicator of good health in dogs is bright and shiny eyes. Shiny and bright eyes indicate basal tears are being created. Tears moistens the eyes and protects them from dust and other very fine debris. However, if your Pomeranian has excess tearing the result is ugly eye staining. Excess tears will pool under the eyelids and then run down over the dog’s lower lids and moisten his facial hair. 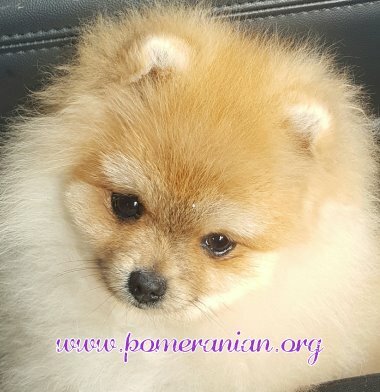 If it happens too often, the tears may stain the dog’s hair and that should be sufficient reason to diagnose the cause of the Pomeranian watery eyes. Certain health conditions cause Pomeranian watery eyes so it’s vital to find the correct root cause of this problem. While it may be assumed that tears are just water, tears actually consist of many elements. They’re a salty fluid, chock full of protein, water, mucus and oil and come from the lacrimal gland in the upper, outer region of the eye. 1 How Blinking Affects Tear Production. 2 Acute Cases of Watery Eyes with a Pomeranian. 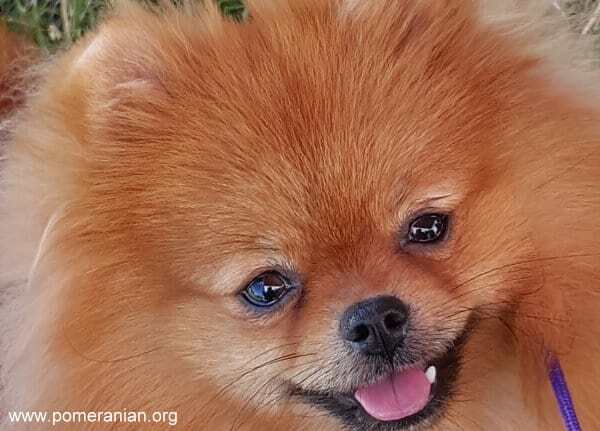 4 Causes of Watery Eyes in Pomeranians. 4.1 Pom Blocked or tiny tear ducts. 5 Pomeranian Watery Eye Prevention. How Blinking Affects Tear Production. Eyes will stay safely moist because of the ongoing creation of tears. Fresh fluid is held in the tear ducts and lower and upper lids. 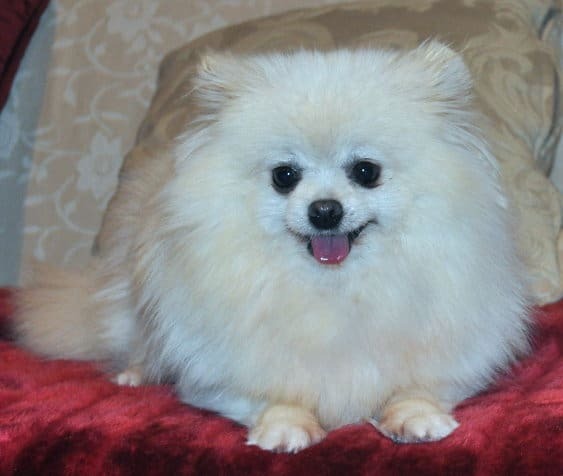 Each time your Pom blinks, fluid seeps out over the eye causing Pomeranian tear stains. Acute Cases of Watery Eyes with a Pomeranian. There’s no official length of time that states whether a medical problem is chronic or acute. It may be hours, days or even weeks. However, with regard to the Pom watery eyes problem, an acute case should disappear on its own within 24 hours. The major reason for acute runny eyes is when a foreign substance enters the eye. The dog’s reaction is to create excess tears to wash away this foreign matter. Even if only one eye gets affected, your Pomeranian will naturally blink both eyes. That normally causes additional tears to be produced. Combine that with the overflow and his eyes will end up being extremely watery. Tiny pieces of dirt are the biggest cause of watery eyes and this happens easily if the dog has been sniffing in grassy areas, or if your dog spends time outside in very dusty and windy conditions. An eye lash or strand of facial hair may also get trapped in the eye itself. 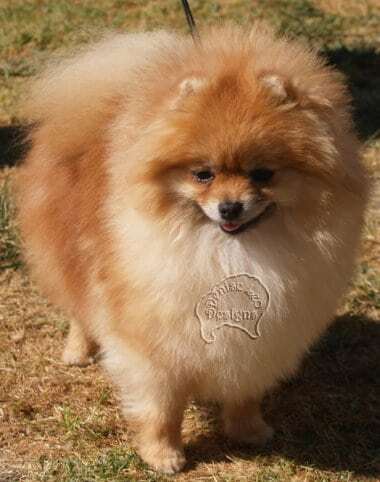 If you gaze into your Pom’s eyes and see the offending fragment, you can usually solve the problem by flushing it out. If the object had been in the dog’s eye for a couple of hours, the eye may take a couples to settle down. Also, the tiny element in the eye can cut any part of the pet’s eye and that means more advanced treatment must be sought. To flush out a Pomeranian’s eyes to eliminate the irritant, you need to use a good quality eye rinse. However, if you don’t have them handy, human eye drops can be used instead. The ideal method is to gently pull the lower lid out and let two or three drops fall into the eye. Once you let go of your dog, he’ll instinctively blink a few times and this spreads the fluid and helps wash the element away. If, for some reason, this doesn’t work, or if other problems arise, you should get your dog to the vet for professional assessment. Don’t leave it more than 24 hours because the cornea itself may be damaged. If you’re not sure if your Pom’s eyes are serious enough to contact the vet, do it anyway. He can carry out a simple test and that will result in knowing if the tears are excessive. It’s an easy procedure where a small, thin sliver of special paper is placed in the lower eye lid. It has numbers that give a reading of how much tears are being made. A range of 15 – 20mm per minute is normal. If the dog is a senior, then a lower reading would be normal. Causes of Watery Eyes in Pomeranians. There are a couple of possible health problems that can cause too much tears to be produced. This is the number one reason why a Pomeranian has clear, watery eyes. Most of the time, that’s exactly what they are. If the fluid is brown, green or yellow, thick or crusty, a different health problem will be present. If you don’t regularly wipe your dog’s eyes with canine facial wipes, the fluid may dry and turn tan or red in colour. Food and seasonal allergies and possibly, to a lesser extent, contact allergies. Most allergies will also cause other symptoms such as: itchy skin (causing your pet to lick or chew at different body parts; sneezing and/or possible hair thinning. If your pet is intolerant to specific foods, other symptoms may appear including: dry retching, vomiting and/or changes to his stools. Allergy-related watery eyes can occur anytime and a dog can grow into or out of said allergies. Triggers can come from: weed and grass pollens, flea control products and dust mites. Because of this, it’s wise to ask your vet to carry out a skin test to identify the trigger (s) that are present. Pom Blocked or tiny tear ducts. This is another common cause for the watery eyes problem in your Pomeranian. Sometimes the excessive tearing in the eyes will be the only symptom. However, the eye may be red and have some irritation. Flushing the ducts can help in some cases and surgery may be the only choice in others. The cornea is the outer layer of the film of the dog’s eye and it’s designed to act as a protective shield. Unfortunately, it’s easily scratched. Dogs love sniffing around in the garden and the eye may get scraped by a twig. In the bedroom or lounge, the corner of a blanket may do the same thing. A runny eye could be the only symptom. Unfortunately, in moderate and severe cases, the tissue surrounding it can go red and it may swell up a little. One eye can easily tear up more than the other. One eye may be reacting to injury and the other is coming to its aid. Your vet can usually work out the depth of the injury. If there are minor scratches, the main aim is to stop him touching his eye so it can heal on its own, usually within a week or so. An Elizabethan collar is generally put around his neck to stop this happening. However, some people dislike this method and a soft contact lens may be their solution. Antibiotics are usually prescribed to stop any infection during this more vulnerable period. This is a genetic condition that pushes the dog’s eyelid partly inwards, thereby making his eyelashes brush against the eye itself, making them tear up. This condition is nearly always diagnosed by the time your puppy turns one. Because dogs are never born with this condition, a dog aged one or more won’t contract this condition. A stray hair or eyelash is still always possible. 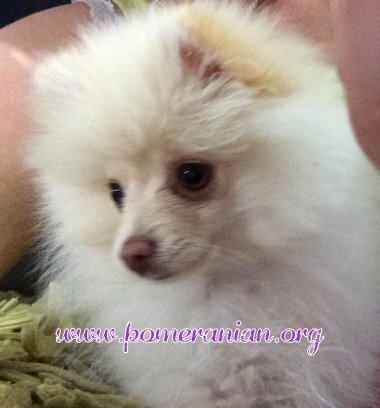 Pomeranian puppies with Entropion often grow enough for the problem to be fixed without surgery. Owners shouldn’t rush into surgery for their pet. If his eyelashes are causing trouble, prevent further risk of damage to his eyes. Keep the lashes soft by smearing petroleum jelly on them a few times each day until the problem ceases or surgery is carried out. It’s simple to diagnose with an eye examination and the vet will also check to see if any ulcerated corneas have appeared. Minor cases are generally handled with antibiotic eye drops. Most moderate and, certainly severe cases, undergo corrective surgery. This condition can cause runny eyes that doesn’t involve the lids, just the lashes. One or more lashes will bend inwards and tickle the dog’s eye, making it water. This may happen on upper, lower or both lines of eye lashes. Symptoms include: watery eyes, possible red eyes, slight swelling, and discomfort that will cause your Pom to paw at his eye or rub it along furniture or carpet. I strongly recommend owners who have a dog with this problem to get treated urgently because it can cause severe ulcerations of the cornea and ongoing infections. Treatment is generally by the use of a particular type of electrolysis known as electro-epilation. A small current of electricity destroys lash follicles permanently. A Pomeranian can get watery eyes due to either viral or allergic conjunctivitis. Typical signs include puffy eyelids and redness. The discharge won’t be a clear, watery fluid. It will be thick and, in most dogs, it will dry to a sticky crust overnight. It can literally glue the eyes shut when the dog tries to open them when he wakes up. The discharge is stretchy and stringy when you attempt to wipe it off. Allergic conjunctivitis may be caused by a dust mite allergy, seasonal triggers such as pollen, and even environmental factors such as perfumes and cleaning products. Treatment includes: antihistamines, cold compresses and eye drops that have steroids to decrease any swelling. If a Pomeranian has viral conjunctivitis, you must know that it’s very contagious to people and other pets. A dog may also have a cold, throat infection or a lung infection. Treatment will vary, depending on any other issues at the time. Basic care would be: cold compresses, antibiotic drops and steroid drops. The dog recovery period is around three weeks. During that period, always wash your hands after touching him, particularly if you’re looking after his eyes or cleaning him. Infection or other illnesses. In some cases, a lung infection or other health issue may cause runny eyes, a runny nose or both. Vets would check this normally regardless of what symptoms exist, even if there’s no known cause. 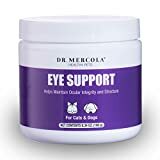 Pomeranian eye care. Even the tiniest of scratches and pieces of tiny debris can make your eye run. You can do a few things to prevent Pomeranian eyes watering, watery or causing Pomeranian tear stains. 1) Routinely clean your Pom’s face and eye area to get rid of all tiny pieces of debris, including food that may eventually get into his eyes. Wiping the lids in a downward motion, so the lids are gently closed as they’re being cleaned. Use a high quality canine facial wipe. If your pet is susceptible to staining, use a wipe that also cleans stains and eliminates debris. 2) Many dogs suffer eye injury while running through gardens or areas where there’s high grass. In such places, there are extra hazards (snakes, insects and ticks) to consider. It’s wise to restrict your pet’s fun time to areas with little grass. 3) Keep eye drops/cleanser on hand in your grooming kit. 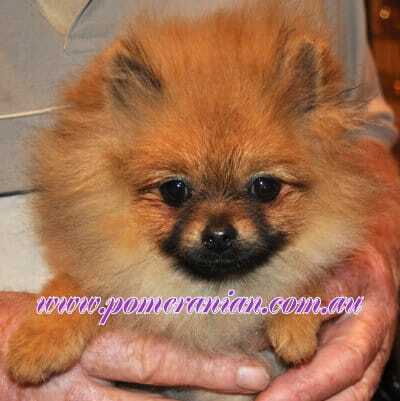 If your Pom gets something in his eye and makes it water and irritates it, you can swiftly treat this at home. Human eye drops are fine, but they have a limited life once you open them. Replace such items regularly. 4) Even for minor runny eye issues, maintain a vigilant gaze on things. Take your pet to the vet if it doesn’t settle on its own inside 24 hours or if other symptoms manifest themselves. Refer to the Grooming section regarding dealing with Pomeranians and eye staining.